(From top left) Scott and I made salmon wellingtons for tea on Wednesday. Sleeping Danny on Friday night. Scott and I were off to a wedding on Saturday night - we had a great time. My parents bought me the new Jamie Oliver book for going back to uni. However I did do a few nice things - on Wednesday I went to Scott's for tea where we made the most delicious salmon wellingtons with black pudding for tea. Probably too much of a treat for a weekday but we loved them. On Friday evening my aunt and uncle came out for tea. I've not seen them since April so it was lovely to catch up and show them all the photos I've taken over the summer. Then after an early start on Saturday so I could get some work done Scott picked me up and we quickly went to Dundee. He had decided (the day we were going to a wedding) that he needed a suit and because he is quite little this was a bit of a challenge. I was a bit nervous what to wear too because I didn't know anyone else who was going but I choose this boohoo number I bought for my summer holiday. We had a lovely time, enough alcohol to make us chatty, a bit of dancing and a late taxi ride home. The people Scott works with are so nice - he doesn't know how lucky he is! I arrived home Sunday afternoon to finish my project off to find another aunt and uncle had popped round randomly. I've not seen them in years (!?) so that was nice even though I wanted to get on with work. My parents also bought my Jamie Oliver's new book... I've obviously been going on about the TV show a lot! 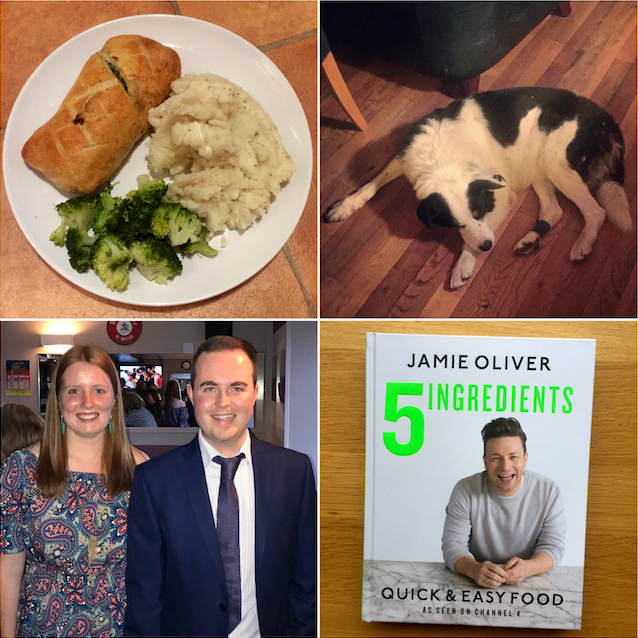 I've not had time for any new blog posts this week but I have been sharing snippets on Instagram so give me a follow there if you want more.